Increasing product complexity has led to the launch of Windchill 10: enabling manufacturers to do more throughout the product lifecycle, know more about product performance and get more value from PLM. Windchill 10.0 allows customers to more effectively define, manage, and validate complete bills of material (BOMs), providing linkages across domain-specific views of product structures throughout the entire lifecycle. PTC has also included a new user experience and improved system administration, making it easier than ever to use and maintain and enabling broad adoption. If you believe business improvement is enabled by process excellence, Windchill 10.0 has some serious value to deliver to your business. 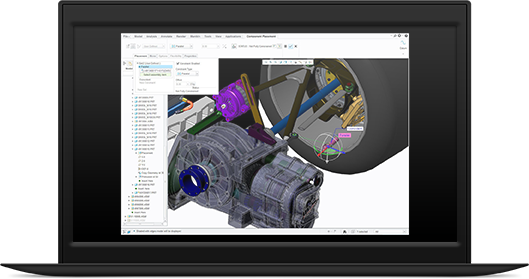 Supports business process optimization for Detailed Design, Variant Design and Generation, and Verification and Validation. With Windchill 10.0, PTC's Relex and Insight product lines have been rebranded as part of the Windchill product family to better reflect their availability as both a stand-alone offering as well as part of a comprehensive Windchill solution. Windchill Quality Solutions (including the former Relex products) help improve next-generation products and reduce the cost of poor quality by preventing repeat errors and building reliability and risk management into the product development lifecycle. New offerings include solutions for CAPA (Corrective Action Preventive Action) to accelerate problem resolution through improved monitoring and root cause identification. Windchill 10.0 enables customers to derive significantly more value from their PLM investment by providing a dramatically improved user experience along with several administrative process improvements. The approachable user experience results in a quick learning curve and expands adoption among casual users. For experienced users, the modern and pleasing user experience drives productivity and satisfaction. For IT professionals, easier upgrades, enhanced administrative support, and robust new system monitoring tools improve maintainability and lower the total cost of ownership. Advanced Table Editor (ATE) -- a new capability within Windchill PDMLink 9.1, provides powerful spreadsheet-like capabilities for working with families of products that have similar structures. Windchill Gateway for Cadence® Allegro® Design Workbench (ADW), an optional module, enables bi-directional component data exchange to synchronize ADW-authored ECAD component data with Windchill. Windchill Workgroup Manager for ECAD now supports Cadence OrCAD® Capture 15.7 and 16.2. Support for the PLM 2.0 schema of PLMServices (OMG Standards Specification for exchanging PLM data between systems). Microsoft Outlook® 2007 Integration (emails, attachments and meetings). Upgraded Windchill Workgroup Manager for CATIA V4. New LDAP Directory Server Option (Windchill DS powered by OpenDS Technology). Alternative to Aphelion directory server. Support for additional types of planning tasks, unit durations and task precedents. Interactive Gantt chart display, including critical path. General Platform and CAD Version Support Updates. Maintenance customers can download the software from the PTC Technical Support software download web page. Note: The timing of any product release, including any features or functionality, is subject to change at PTC’s discretion.